We all know that life is made up of all sorts of changes, great and small, but if you’re anything like me, this can be debilitating and terrifying. I do not adjust well to change at all. In fact, about an hour and half into the three hour car ride home after purchasing our first pet together, I looked at my husband (then, fiancé), and asked with all the earnestness I could muster if we could please just turn around and take Franklin back. Similarly, about a day after the offer we put in for our first home, I asked Charley what we could do to cancel, and fervently prayed that the inspector would find some structural damage or deadly mold so that we could get out of our contract. Fortunately, my husband said no to both, and we are now a happy family of three in a lovely home, and I really enjoy our life, but the thought of huge disruptions to my routine and my general feelings of comfort and contentment cripple me. While adding a pet to the family and buying a home together constitute fairly large changes for a married couple, they pale in comparison to adding a child to the mix, or so I’m told. We don’t have children at this point, but I can only imagine that if getting a dog is scary, then adding a living, breathing human being who you have to feed and bathe and teach and discipline can be overwhelming, but all of my parent-friends tell me it’s probably the best change that has ever happened to them. To get the inside scoop on what it’s like to be new parents and to find out about some of the challenges and the blessings that come along with the new addition, I talked to three sets of new parents who are all in various stages of the parenting process, and they shared with me valuable insight and wisdom about what it’s really like to add another person to your household. Trey and Elizabeth Tackett had only been married six very short months before they found out about the surprise, impending arrival of Mary Nelson, their now two-year-old sassy and spunky girl. Both Trey and Elizabeth came from very strong, close, and supportive families, so they both knew that they wanted to be parents, themselves, one day; that day just came a little sooner than the newlyweds expected. Elizabeth reflected on learning she was, in fact, pregnant, saying, “When I saw the results, I kind of panicked. My heart skipped a beat. I felt like I wanted to faint, cry, laugh, vomit, and everything in between.” She says she always thought she would tell Trey about their first conception in some fun and sweet way, but she settled for running to the bed and flopping down beside him, showing him the results, and crying because she was scared to death. She recalls Trey’s reaction as calm and loving, even though she knows that he was probably as scared as she was. Elizabeth says, “We were young, broke, newly married, and inexperienced kids, but the Lord had just entrusted us with one of His children.” Mary Nelson was not part of the Tacketts’ carefully planned three-year plan, but she was definitely part of God’s plan for this couple. Trey and Elizabeth had the same visions of having children that a lot of us grow up with – get married, wait a couple of years, build some financial stability, buy a nice home with a large yard, and then welcome the new baby into this established, picture-perfect life. However, as Elizabeth notes, what we think we want and what we actually need are not always the same, and luckily, God knows and gives what we need, and the Tacketts needed Mary Nelson. Needless to say, Trey and Elizabeth’s expectations of what parenthood would be like didn’t exactly match up with the reality that awaited them when they brought their daughter home. Elizabeth dealt with post-partum depression, and Trey enrolled in engineering school shortly after Mary Nelson was born, but Elizabeth says that all of this made her cling to the Lord even more because she realized she was “merely an instrument the Lord was using to take care of His child.” She knew that she had no control, and while that was hard for her, it was also very freeing. Trey and Elizabeth’s lives changed tremendously in the first year. They both had to adjust to having very little time for themselves for the hobbies they enjoyed before Mary Nelson came along, but both of them say that they wouldn’t change any of that now. Parenthood has proven to be a rewarding experience for both of them, and it is also something God has used to teach the couple more about Him. Elizabeth says she has learned so much about patience and grace from being a mom, and while displaying both to her husband and her child is something she has worked hard on, she is also learning that God wants her to have grace for herself. Bobby and Savannah D’Alessandro also weren’t expecting their bundle of joy, Robby, now an active and adorable one-year-old, to come when he did, either. Much like the Tacketts, Bobby and Savannah hadn’t been married for very long when they found out they were expecting, but they had already been planning for kids. In fact, just three months before Savannah got pregnant, the D’Alessandros had surrendered to the call to be adoptive parents and were eager to start the process of adding to their family in that manner, but God had different plans. While they still plan to adopt eventually, God made it pretty clear that He wanted them to have a biological child first. Much like Elizabeth, Savannah felt the full gamut of emotions when she first found out she was pregnant. She says she even went through a period of her pregnancy where she didn’t want to be pregnant at all – “I felt I wasn’t ready to be a parent nor did I really want to be a parent at this point in my life or my marriage, but as the nine months trucked along, my regret and disappointment turned more and more into excitement and anticipation.” Bobby and Savannah had several friends with children, so their expectations, for the most part, were pretty realistic. They expected life to get harder with less sleep and more responsibility, but Savannah says that she didn’t anticipate how hard it would be to maintain relationships and friendships once Robby came along. Getting out of the house with all of the accoutrement a baby needs is a chore, and now that Robby is a toddler, Savannah says that “just the simple act of going out to eat is exhausting.” Robby is all boy and quite active, so it is next to impossible to get him to cooperate for an entire meal at a restaurant, so a lot of the time, they opt to stay in. Some of the other challenges they have faced include how much the exhaustion can affect other areas of their lives, especially when it comes to connecting as a couple, post-baby. Bobby and Savannah also had the added challenge of facing childhood cancer as brand new parents, so for them, connecting and spending time together was extra important. Savannah says, “It would’ve been really easy to retreat and put up walls between us as a couple, but we knew that we had to support and encourage each other throughout our journey.” Luckily, the challenges of new parenthood are only a part of the experience, but the blessings are a whole other category, and Robby has brought many to the D’Alessandros. Savannah says that there is just more joy in their lives, so much that “Robby’s smile makes [her] feel like [her] heart might bust wide open.” God has also taught Bobby and Savannah a lot through being parents, especially about being less selfish and more invested in others. They are both realizing more and more that it is people and not their own stuff or jobs that really matter. Nathan and Ashley Taylor had a much longer and a much different journey to parenthood. Their daughter, Lainey, who will soon be eight months old, joined their family after the Taylors had been married for fifteen years, and she came through adoption. The Taylors tried for over twelve years before they became parents. After battling infertility and a miscarriage, the couple turned to adoption but also experienced a heartbreaking failed private adoption before connecting with an agency. Actually, both Nathan and Ashley understood that God hadn’t promised them a child through adoption but that He had given them permission to try that avenue even though it might not result in them becoming parents. Even after that, it still took three years for a child to be placed with them. Ashley knew that she always wanted to be a mom, but she says that that was never her foremost goal in life, and she didn’t have the desire to be a stay-at-home mom at all; however, once Lainey got here, that desire grew, and now she does stay home with their new addition. Because of how long they struggled to become parents, Ashley didn’t have many expectations about what being a parent would be like because she had never let herself think about that too much. Even without specific expectations, the Taylors have found parenthood to be a truly amazing experience that pales in comparison to any expectations anyone might bring to the experience. Ashley says she now has a whole new view of what being a parent really means and that she has realized, in eight short months, that it is really so much about love and sacrifice. The Taylors’ lives have obviously changed since Lainey came along, but Ashley says that the changes are just different, not necessarily better or worse than before. Their day-to-day as a family just looks different than it did when it was just the two of them. Caring for Lainey has been very humbling for the Taylors as they are realizing that she is completely dependent upon them, and she has made life “so much sweeter.” As far as what the Taylors have learned by becoming parents, God has shown them that we are really selfish creatures but that you can’t be selfish when caring for another individual effectively. God has imparted to Ashley how great of a responsibility she has to lead her child to Him, which pushes her to live a surrendered life so that Lainey can grow from that example. 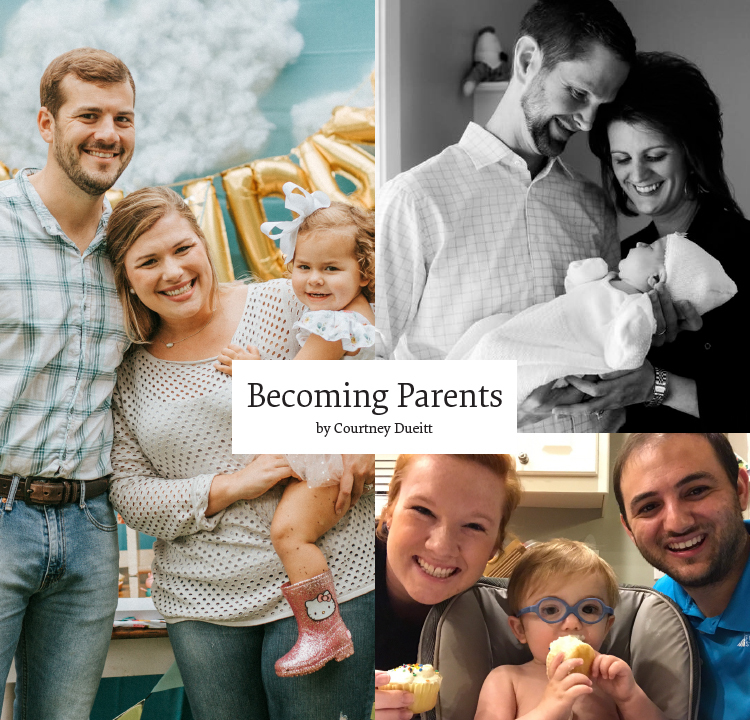 While each of these families’ stories differ in many ways, all of these new parents agree that all of the challenges and changes are worth the blessings that come from God through their children. They also agree that there is never a great time or a right time to add to your family and that there is no such thing as being “ready” to have children, and their stories illustrate how God’s timing is often very different than our best laid plans for ourselves. No matter what stage you and your spouse are in when it comes to having children – whether you’re trying to conceive or adopt, walking through the pain of infertility, expecting your first child, or have recently brought home your own new addition– I think all of these new moms and dads would say trust God in the place you’re in now and look for what God is trying to teach you through this experience, and above all else, know that you are not alone. God is with you on the journey, and there are many people within our church family who can relate to where you are – reach out and share your fears, anxieties, hurt, excitement, and triumphs so that what God is doing in your life might encourage someone else.